It's Friday and that means there is exactly one week until Christmas. ONE WEEK! I'm usually incredibly excited at this point, but this year I just can't get in the mood. I'm sure it has something to do with the fact that I still have to finish shopping, wrap gifts and get my house in order. Does anyone else get the urge to purge like crazy this time of year? Last weekend I did manage to trash or donate a bunch of things we either don't want, need or use, but I still have more crap I'd like to get rid of. Knowing an abundance of toys will soon be flooding into our home is a little frightening. Where the heck am I going to put everything? Since this is the last weekend before Christmas I'm hoping to squeeze in a few DIY gifts between hosting friends and cleaning house. 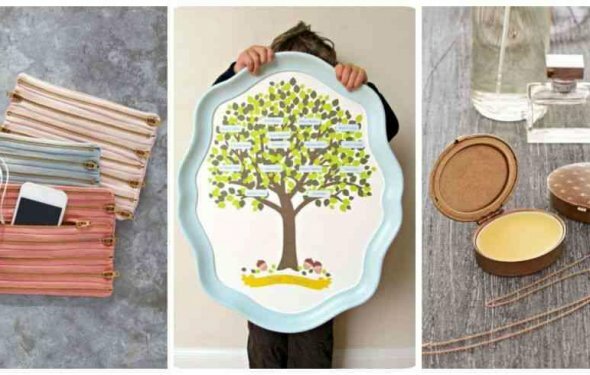 If you're also planning on giving handmade gifts, but aren't quite sure what to give, these 14 creative ideas are sure to be a big hit.